The James family has been finding ways to reuse water as much as possible. Living sustainably borders almost on an obsession for the James family. They grow much of their own food, only use organic products, keep chickens and have long used the many natural springs around Cape Town that provide alternative sources of water. They’ve always been careful. But the prospect of "Day Zero" -- the day when the South African city runs out of water -- is a whole new reality. 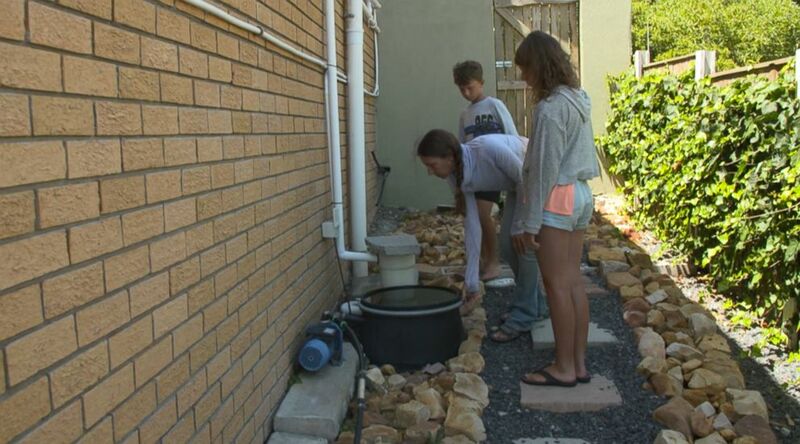 Liesel James is busy collecting what the family calls "gray water" from around her house. That’s soapy or contaminated water that’s been used for cleaning or cooking, but can still be used elsewhere. This story is part of an upcoming “Nightline” report. “Nightline” airs at 12:35 a.m. ET weekdays on ABC. (ABC News) The James family has long used the many natural springs around Cape Town that provide alternative sources of water. Containers are taken from the kitchen to the garden daily, and large buckets sit under the shower to stop water being wasted. Her three children, Tala 15, Safiya, 12 and Zenon, 9, are making adjustments too. “Our kids get very excited -- it’s become almost a challenge to see how little water they can use. I’m very proud of them,” says Liesel. “Children of climate change,” adds Tala's father, Kevin James. (ABC News) For their children, "It’s become almost a challenge to see how little water they can use," said Liesel James. Showers are no more than two minutes long, and when using the toilet, the family subscribes to the familiar refrain, "If it's yellow, let it mellow. If it’s brown, flush it down." (ABC News) In order to conserve water, the James family also keeps track of how often they flush the toilet. With nearly 4 million residents, Cape Town is South Africa's second-most populous city. The average Capetonian may be trying to adhere to the strict water usage guidelines, but changing fundamental lifestyle habits is a taller order. Each person is allowed to use only 50 liters (13.2 gallons) per person per day from their taps. The average American uses about 200 to 500 liters (roughly 53 to 132 gallons) per day, according to the U.S. Geological Survey (USGS). The date the city estimates it will run out of water has changed over the past few weeks. The city announced in a Feb. 19 statement that the date would be July 9. 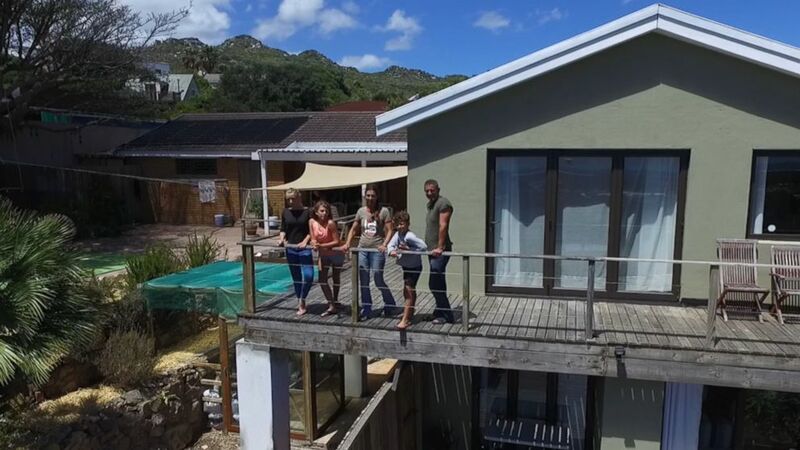 (ABC News) The James family seen here at their home in Cape Town, South Africa. Over the leafy hills from the Jameses' suburban neighborhood is one of Cape Town’s largest townships -- effectively slums where millions live without regular access to water or electricity. Hundreds must share communal taps. If the water turns off, the potential for unrest is frightening. “South Africa is probably one of the most unequal countries in the world,” Kevin says. “I believe what’s going on now is a great leveler. Because no matter how affluent you are or how poor you are -- I think the poor are possibly better prepared for the situation than the very affluent families who have taken this stuff for granted. So it feels like we are in a bit of a social experiment. "It’s daunting," Kevin continues. “It’s the first thing we wake up with. I liken it a lot of the time to how people must feel when there’s imminent war. Where there’s uncertainty about being invaded. It is potentially apocalyptic. We have no idea -- it’s unprecedented. No major city in the world has experienced this. And I think most people have got absolutely no clue how reliant we are on water for every part of our daily lives. "We’re about to find out."